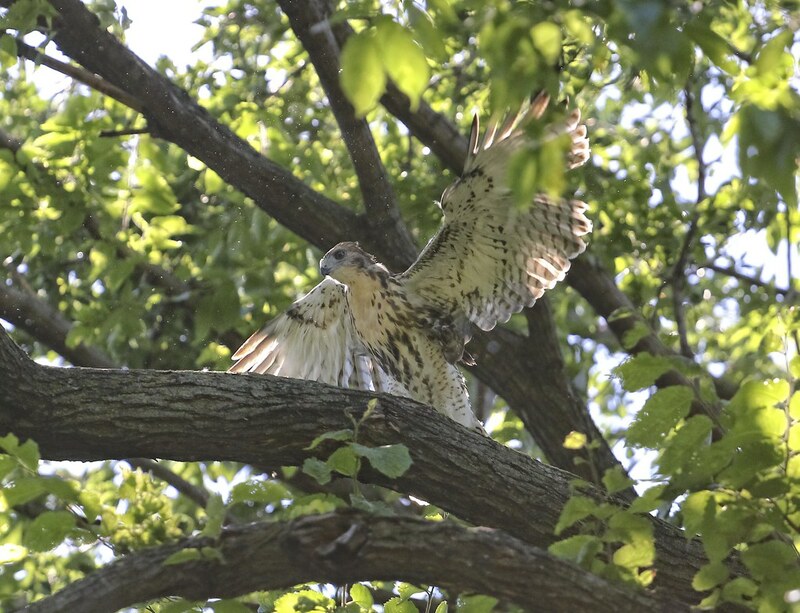 As of today, we still cannot be sure the third Tompkins Square hawk has fledged. 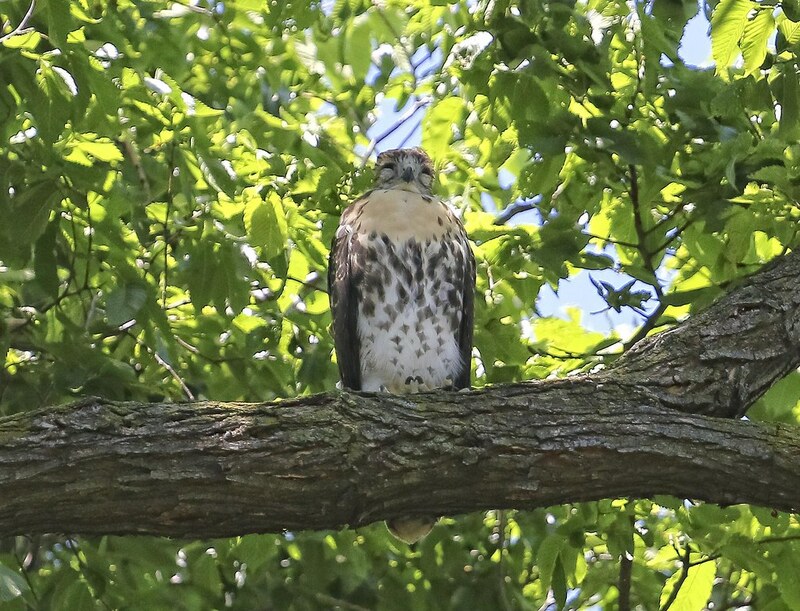 My gut feeling is that it has not, but all three hawks have been spending a lot of time on and around the nest, up in the ginkgo tree. 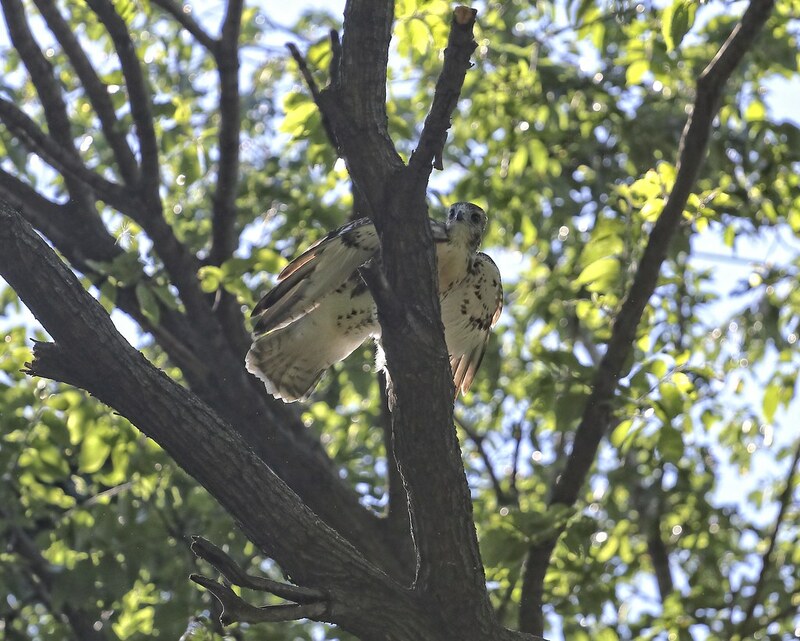 As the first two fledges keep returning to the nest to eat, it's not really possible beyond this point for me to be able to tell the difference between the individuals. 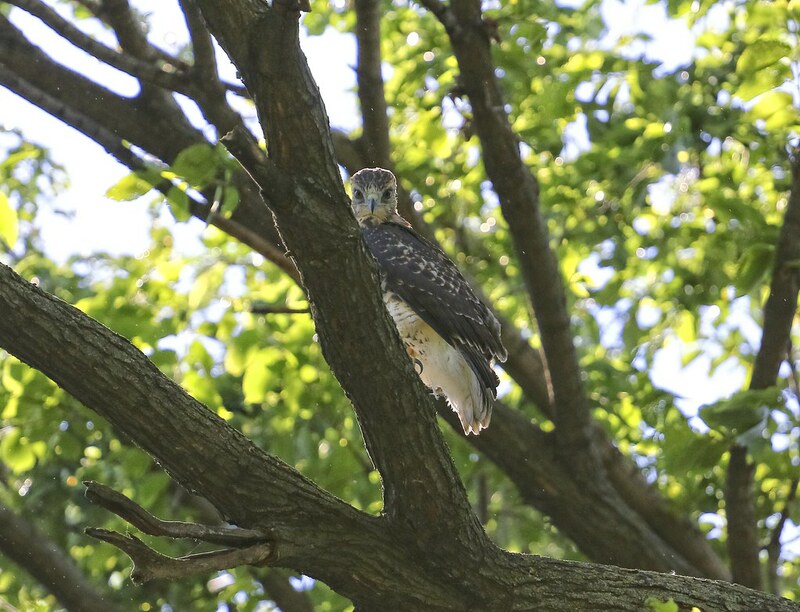 On Sunday, however, I am 99% sure Fledgling #1 was out and about on the east side of the park. 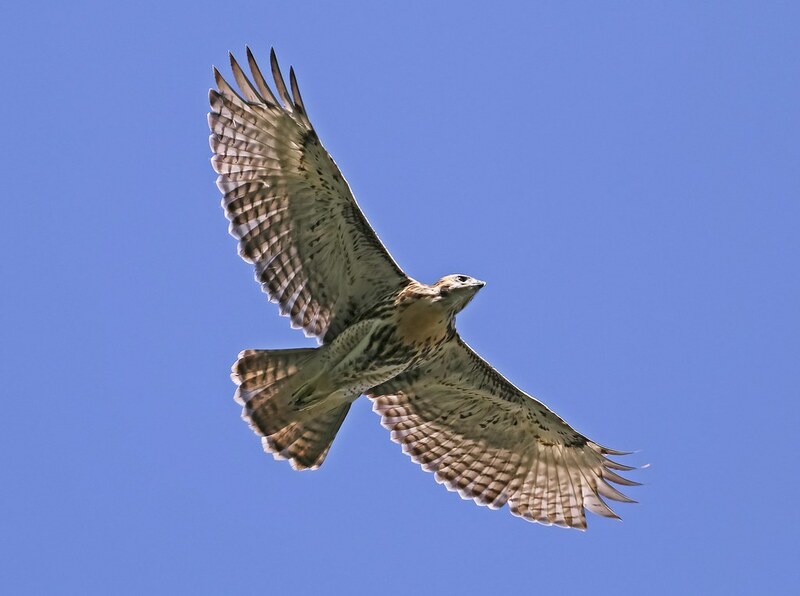 I compared the chest markings with those of the hawk that fledged to the church, and they do seem to be different. 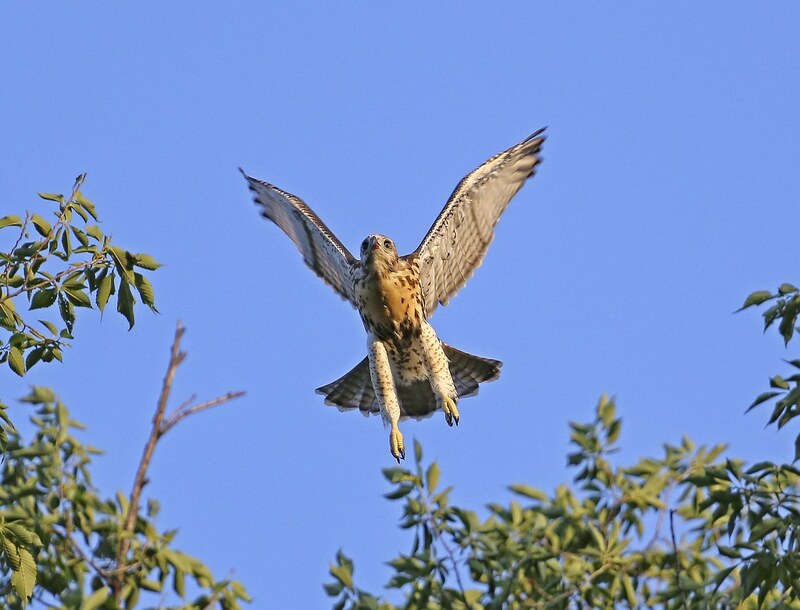 This particular hawk also demonstrated confidence flying between the nest and nearby trees. Learning to fly is hard work - time for a nap! 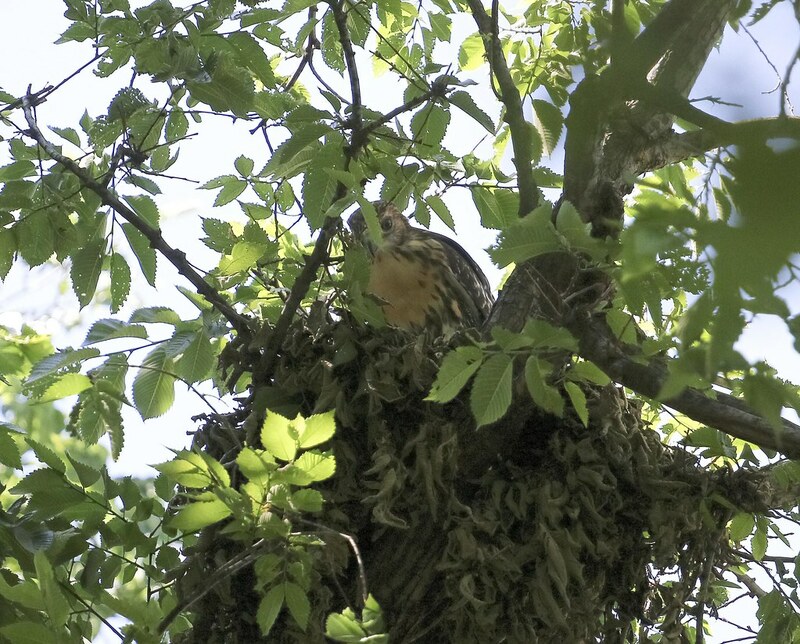 The fledgling found a squirrel nest near the dog run. No one was home, so it laid down in the nest and had another nap. 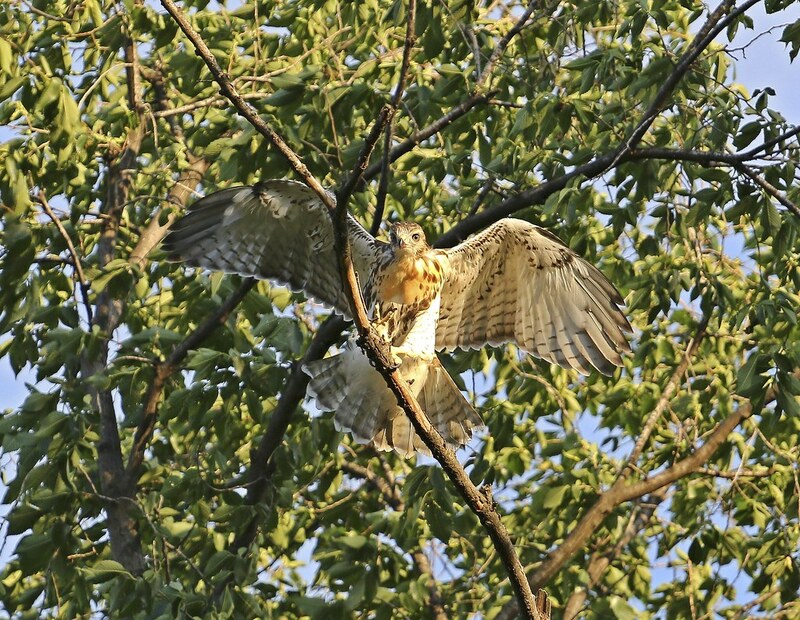 Around 7pm, after all three young hawks had dinner at the nest, one flew out to explore the trees near the Avenue B and 9th Street park entrance. 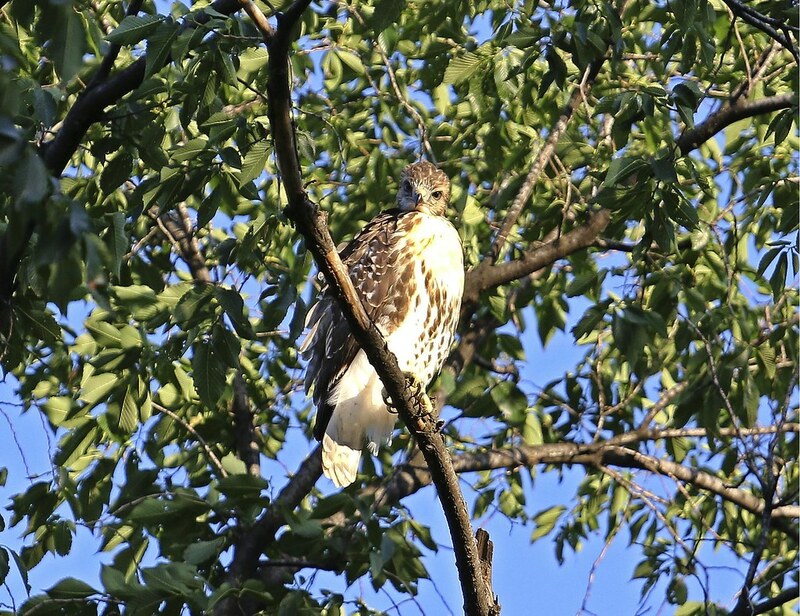 I believe this is the same hawk as in the photos above. It was a very windy day, with gusts 30-40 mph. 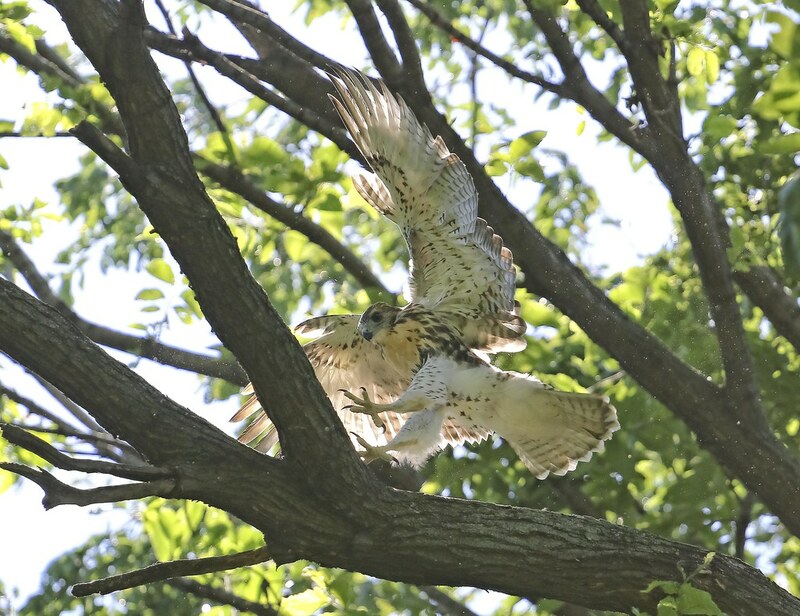 The hawk had to work hard to hang on to the branches, which were bouncing around like crazy. It had to flap to stay in position, but managed to cling to its perch. 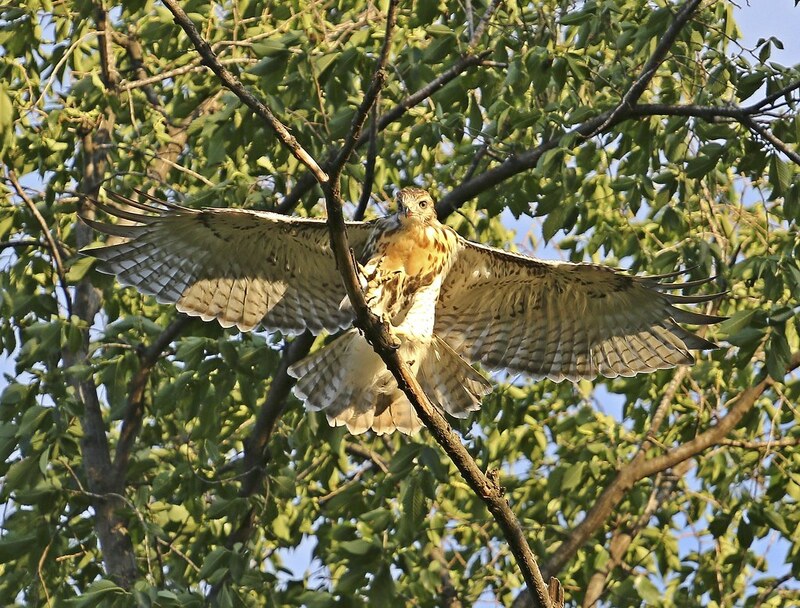 As the last of the sunlight disappeared, the hawk flew to a higher tree. The red spot on its beak is left-over dinner. 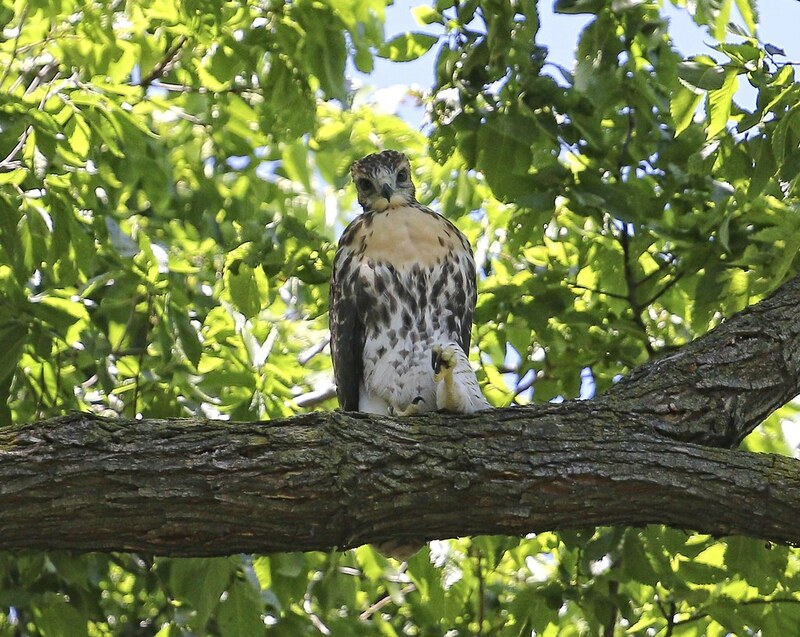 So far, the hawks have stayed in the higher parts of the trees (and the church roof). 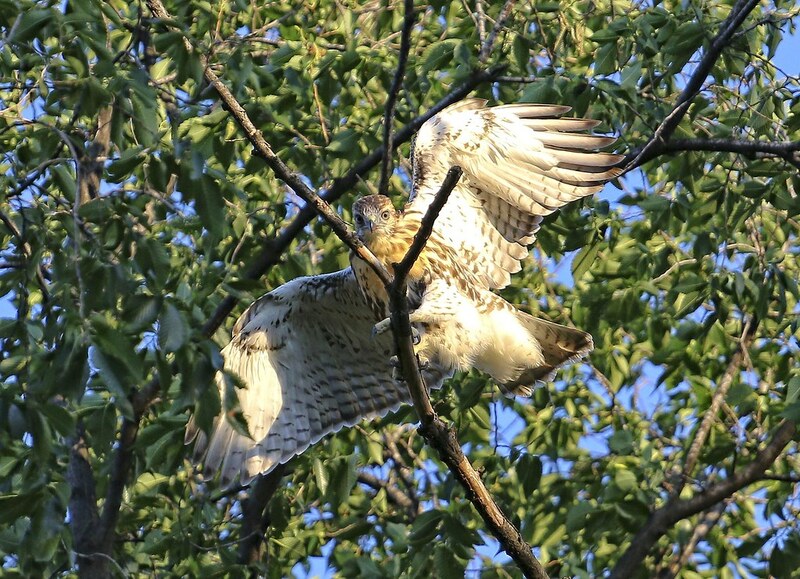 The parents have not yet begun teaching them to hunt and seem content to keep letting them feed at the nest. Urban Hawks also has some photos here.